Voted by you, styled by me, February’s winning style has to be one of my current favourite looks. I’ve been wearing this style EVERYWHERE. From work to dinner to a party, it’s simple, quick but oh so glam. And even if you don’t have a lot of hair, it enables you to fake the volume. No sock buns needed. You’ve voted, now watch and rock your version! Thank you to all the ladies who have shared their January style versions with me. 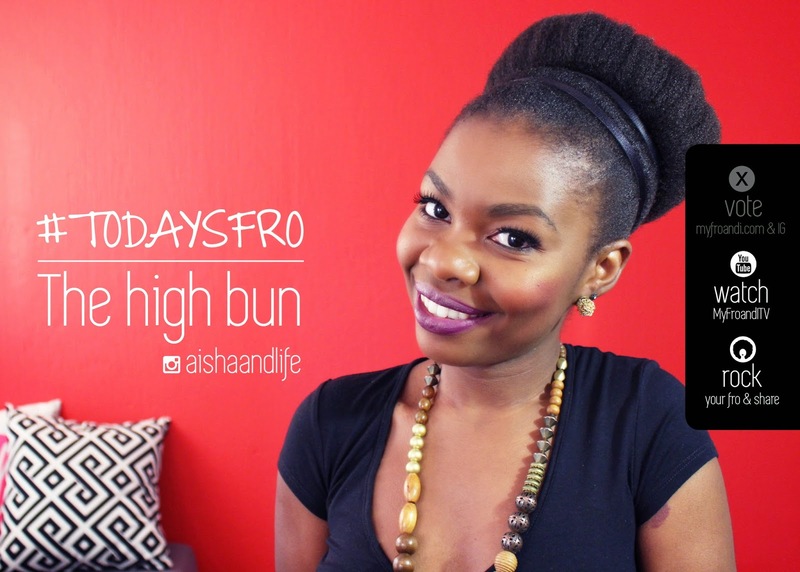 If you’d like a chance to be featured on my IG or Facebook page, tag me @aishaandlife and #todaysfro in your version of the High Bun style! Next Post Win a Hair Makeover & #BeSensational! This is so simple and cute! I must try this, especially for my lazy days during the week for work. Thanks for sharing. Thanks Milan, gllad you like 🙂 Please share a pic when you try it! I love the evolution of this blog. The quality of the video was fantastic, great job. Love the style but my afro isnt quite that long yet so not sure I can do the style but will definately keep this one in my arsenal for later. sad my number 3 didn win but…. This is lovely as well! Thanks, not all of them can win but yes, it's an alternative – and a great one at that 😉 Please share pics of when you try it!